Click on Calendar (next to list). In the upper right, click on the wrench and click on Export in the drop down menu. A window will open with two options. 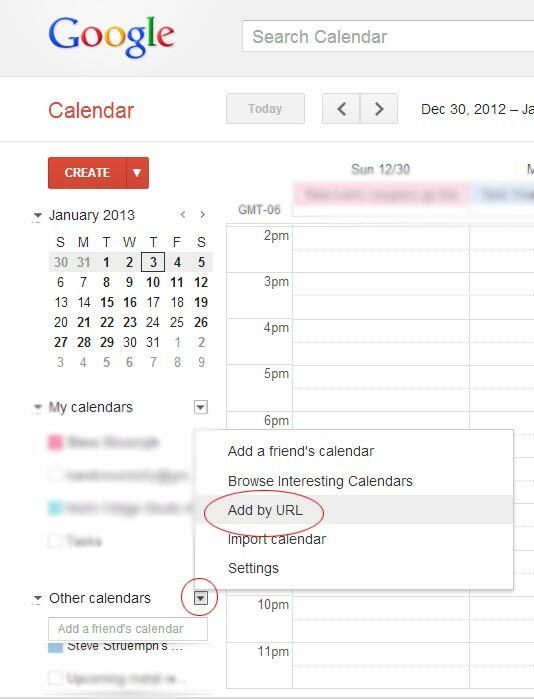 To export events or birthdays to Google Calendar SAVE the link (do not click on it). Right click or option+click (for MAC) and save link location. Go to Google Calendar in a web browser. Paste the URL link that you copied from Facebook. Click Add Calendar. That’s it, your events from Facebook should now appear in your Google Calendar. Thank you, steve! Super helpful! This doesn’t work. It hasn’t worked in months. Err Facebook. Err Facebook… I can agree with that sentiment! Ha. But, I’m wondering why this technique isn’t working for you? I realize that sometime, months back, as you said, the old way stopped working but this is a revised method that should work. It is working with my calendar when I just tested it out. You might have to delete and re-add it. Also, if you receive this error: http://imgur.com/EizFO3Q, be sure to right click on the link as outlined in Step 4 and choose Copy Link Address (or something similar). I found out a roundabout way that if you click on the link (on a mac), you will be prompted to open Calendar. Highlighting and copying from this message will not work and produce the aforementioned error. Interesting. This is not working for me, either. The link imports to my iCal just fine, but nothing comes through in my Google Calendar. Odd. I have a mac and also cannot get my Facebook calendar into my gmail calendar. I can get it into Ical no problem. Did anyone figure out how to fix this, it used to work for me? I tried to delete it and re-add it but that also did not work. Thanks! nope doesnt work, URL shows in iCal, copy/paste in to google add by URL.. nothing shows in google. Woohoo, I figured it out!!! I was having trouble importing my FB calendar into my gmail calendar. Heres what I did: I clicked on an event that I’m attending, and in the top right I clicked on one of the headers looking for Export Event. I clicked on that, and thats where I found the link that you need to copy to have all events import into google calendar. I copied the URL and posted it in Other Calendars and my FB events imported into my calendar. Hey Steve u r great..
this works, but the real need is for facebook page that I have.. how can i get the ical export from a page? Been trying and cant seem to find a way..always reverts back to my fb profile event list. Hi Scott, I’m not sure I understand your question. Do you have a Facebook page with events? The Address that you provided did not contain a calendar in a valid iCal or GData format. I get the same reply…..did you fix a way to fix this? Hi Steve, yeah for the most part this was pretty helpful, but for some reason there’s a number of birthdays for friends which, although they APPEAR on Facebook–since obviously, some people can edit their “About” section so that not everyone can see them–they aren’t Exporting to EITHER Google Calendar, or Apple Calendar (I’m now on Mountain Lion, but the programs–and most of the exporting guidelines–are pretty similar). I’ve tried multiple times, it seems the only way I can add them is to manually add them to Calendar. Any ideas?? So… this works, for me, but it doesn’t seem to add new events to my google calendar. Do I have to export everytime I get an event invite? You now have to go to an individual event then click export. the link will be given in a popup. On my google the calendar shows some facebook-events that I have declined, and no events before today is displayed ..
Oh well, at least the facebook-events on my ipad matches the events on the calendar on the facebook-page exactly .. Thanks so much for this info. I never would have figured that out myself! thanks Søren, your Freedom Konscript works really well! Thank You!! It auto synced everything, including private events which aren’t synced using the articles method. Wow, finally I don’t have to see everyone’s mundane events in my calendar! This is awesome, thank you! I tried to make two different exports with your service: one for the events I confirmed, and one for the events i answered “maybe”, that I made appear in grey in my google calendar. It works fine… but only for a few hours! Then the first export uses the same filter as the second, and i have two times the “maybe” events coming in Google Calendar. Do you know why and if there’s a workaround?? How do I make this work for a business Facebook page? This is my same question! I need to get the events off my page–and ONLY for my page–to a google calendar. I don’t want my personal events, birthdays, etc. just the events created by my page. Please tell me, once I ‘export’ my Facebook events to my Google Calendar, will the two stay in sync after that or do I have to periodically repeat the export operation? It seems that as long as both Google Calendar and Facebook Events have been around between the two of them they would have worked out some seamless way to copy synchronize Facebook events with Google Calendar. I’ve had my Facebook calendar synced to my Google calendar using the method I describe in since this post in January. I’ve never had to tell it to sync… it is automatic. Is your facebook email a google email? Thank you Steve! Works like a charm. I wasted a few hours exporting it to Microsoft Outlook before I found this post. I then exported it in a matter of seconds. And I also have the same question as @Fred Grandt. Do I need to keep updating my calendar or is it in sync already? Ben, it’ll stay synced with Google Calendar. Mine has been syncing automatically since I wrote this post back in January. This worked perfectly!! Thanks for the tip! Everything popped right up! Hey, I have this really frustrating error. Tried to do this on chrome, FF, IE, deleted cookies and so on, but still does not work. It worked fine for me the first shot. The only addition I need to add is, if you want to see the events on your Galaxy devices you need to go to your device’s calender and go into it’s menu and click calenders, then click display and make sure the check box is checked next to the friends’ birthdays line. That’s it… works like a charm! Hi, Steve, you don’t happen to know a method for doing the reverse…? 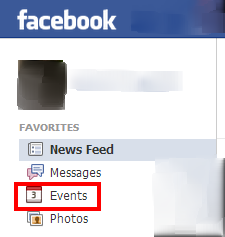 Having Facebook populate events in the events listing on a FB page using those on a Google Calendar? Several people asked the same question. Is there any way to export events from facebook fan page, not from personal profile. Hi. I followed the exact same steps and the Facebook calendar doesn’t sync. It appears in the calendar lists but no event is showing up in the calendar itself. Does’t work on Outlook.com calendar either. Nor on my mobile device (Lumia 800). It’s been working fine until 2 weeks ago,on all three (Google calendar, Outlook calendar and on my mobile device), now it simply doesn’t show any Facebook events. Tried sync in every way know to me. It just doesn’t work. Hi! got it to sync only events to my google calendar on my desktop but not my S4, is there a way to show it on my phone too? For everyone who want it, but it’s not working: If you got a error at the begining with the import, you have to do it again and again until it work. I tried it like over twenty times. And after if you imported successfully you can see your fb calendar in Google like u can check out, but you don’t see your facebook events in month-view – don’t worry it takes minimum 8 hours to import it properly at first time (in my case it took 15 h to change the name from “webcall://…” to “Friends birthday”, and another 15 h to import events). Google calendar sync with Facebook once a day. For mobile you can also download “Calendar Sync for Facebook”. It’s far more efficient. Worked like charm for me.